Kick start your VO career TODAY! 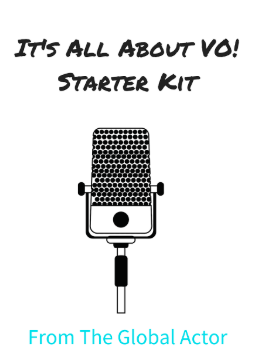 YES, I want the VO Starter Kit! Episode 1: What you need to know before starting a VO career. Episode 2: 3 Steps to take not to start your VO career! Episode 3: Do you need to take a class to be a voiceover artist? Episode 4: What are the different types of VO gigs? Episode 5: Do you need a separate agent for your VO career? Episode 7: Do you need a VO reel to book work? Episode 8: "You Booked Your First VO Job- Now What?" With Elise Arsenault, The Global Actor.